When on a camping trip nothing should be carried but the necessities, and the furnishings should be made up from materials found in the woods. A good spring bed can be made up in the following manner: Cut two stringers from small, straight trees, about 4 in. in diameter, and make them about 6 ft. long. All branches are trimmed off smooth and a trench is dug in the ground for each piece, the trenches being 24 in. apart. Small saplings, about 1 in. in diameter, and as straight as can be found, are cut and trimmed of all branches, and nailed across the stringers for the springs. Knots, bulges, etc., should be turned downward as far as possible. The ends of each piece are flattened as shown at A, Fig. 1, to give it a good seat on the stringers. A larger sapling is cut, flattened, and nailed at the head of the bed across the stringers, and to it a number of head-stay saplings, B, are nailed. These head-stay pieces are cut about 12 in. long, sharpened on one end and driven a little way into the ground, after which they are nailed to the head crosspiece. In the absence of an empty mattress tick and pillow cover which can be filled with straw, boughs of fir may be used. These boughs should not be larger than a match and crooked stems should be turned down. Begin at the head of the bed and lay a row of boughs with the stems pointing toward the foot. Over this row, and half-lapping it, place another row so that the tops of the boughs lie on the line C and their stems on the line D. This process is continued until the crosspiece springs are entirely covered, and then another layer is laid in the same manner on top of these, and so on, until a depth of 6 or 8 in. is obtained. This will make a good substitute for a mattress. A pillow can be made by filling a meal bag with boughs or leaves. A good and serviceable table can be constructed from a few fence boards, or boards taken from a packing box. The table and chairs are made in one piece, the construction being clearly shown in Fig. 2. The height of the ends should be about 29 in., and the seats about 17 in. from the ground. The other dimensions will be governed by the material at hand and the number of campers. 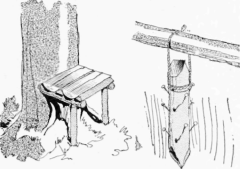 A wash-basin support can be made of three stakes, cut from saplings and driven in the ground, as shown in Fig. 3. The basin is hung by its rim between the ends of the stakes. 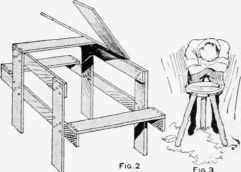 Wherever a suitable tree is handy, a seat can be constructed as shown in Fig. 4. Bore two 1-in. holes, 8 in. apart, in the trunk, 15 in. above the ground, and drive two pins, about 12 in. long, cut from a sapling into them. The extending ends are supported on legs of the same material. The seat is made of a slab with the rounding side down. A clothes hanger for the tent ridge pole can be made as shown in Fig. 5. The hanger consists of a piece, 7 in. long, cut from a 2-in. sapling, nails being driven into its sides for hooks. The upper end is fitted with a rope which is tied over the ridge pole of the tent.